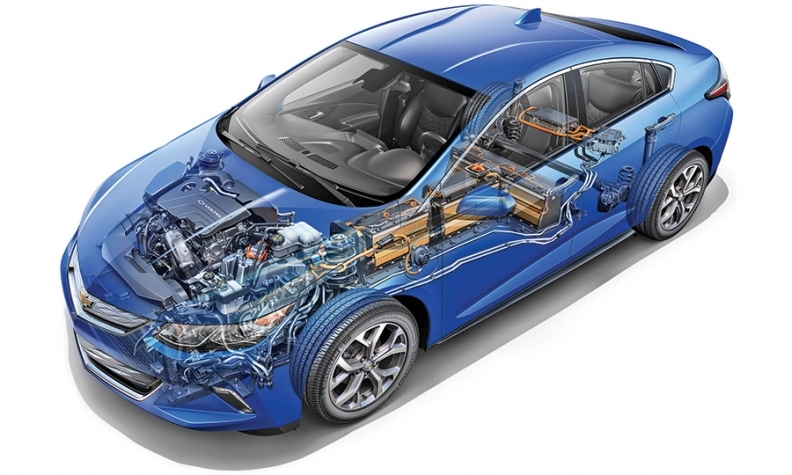 General Motors engineers put the 2016 Chevrolet Volt on a diet to increase its performance and boost its range on a single battery charge to 50 miles from 38. The plug-in hybrid, which goes on sale in the second half of 2015, shed 243 pounds from the 2015 model. A significant share of that weight was cut from the gasoline-electric powertrain. Here’s how GM made the Volt’s powertrain lighter, along with some other notable engineering changes. Hover over each label for a description. GM engineers worked with Korean battery supplier LG Chem to revise the chemistry of the lithium ion battery pack, making it lighter and more powerful than its predecessor. The new pack weighs 403 pounds, down from 434 on the 2015 Volt. Maximum power is up to 120 kilowatts from 110. The gasoline engine’s displacement grew to 1.5 liters from 1.4, but the block switched to aluminum from cast iron. The new engine features direct fuel injection and makes 101 hp. Despite the high 12.5:1 compression ratio, it uses regular fuel. High-compression engines deliver more power but they usually require premium fuel. GM created an electric transaxle that uses two motors to drive the car and a small third motor to lubricate and cool components. The previous transaxle used one big electric motor. The new transaxle uses one motor at low speeds, a combination of the two at less than full power at cruising speeds, and both motors at full strength during rapid acceleration. The new motors use rectangular, not round, wire for improved efficiency, compactness and thermal performance. The new transaxle is 33 pounds lighter than the 2015 version. The controls for the electric motors, battery pack, brake regeneration and charging systems are now integrated inside the electric transaxle. This saves space and weight and eliminates underhood clutter. For example, six heavy electric cables are no longer needed, helping shave 14 pounds.